As my Swedish girls already mentioned, time flies by and I am so sad that there are only a couple of days left here in New York. But I will come back! 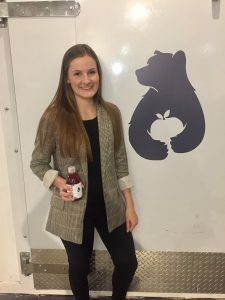 I have been working at the kombucha start-up Bear’s Fruit. For everyone who does not know what kombucha is – it is a functional beverage, my colleagues used to call it Tea 2.0. The basic product of kombucha is tea which has already a bunch of powerful antioxidants. The tea then ferments with a SCOBY, which produces billions of probiotics, a boatload of vitamins and acids. Working in a start-up is definitely a unique experience with a huge potential for personal development. It is dynamic, challenging and no two days are the same. So there is definitely no time to get bored. My team consists of Amy and Chris, the two founders (and no they are not a couple) and the chemical engineer Isabella supporting Chris with production-related tasks. Bear’s Fruit’s office and production space is located at Industry City, in Brooklyn – a really fancy old industrial site with hip food places and plenty of other fast-growing businesses. At Industry City, we work, produce and develop new product ideas – everything in one huge production space. So I am not only involved in business-related topics but also confronted with issues around the production and R&D process….really interesting! It is also so great and valuable to experience the challenges of building a brand from scratch, setting up a distribution strategy and scaling a business. But “hard work bears fruit”– So the strategy of Bear’s Fruit seems to work out! And with Amy, a former manager of ZICO coconut water (coca cola company), I have a really skilled and experienced supervisor and coach by my side to learn from. I am happy that I got the offer to extend my internship with Bear’s Fruit for at least two more months. Nevertheless, I need to say “Goodbye” to all the international students from New Paltz and my lovely Swedish roomies. I love you, girls! As probably everyone can assume, after 4 months of sharing one single room and spending time together, it is not easy to say Goodbye…but let’s say it is rather a “See you later”. Now I am looking forward to spending Christmas with my family in Germany before I will come back to the United States.